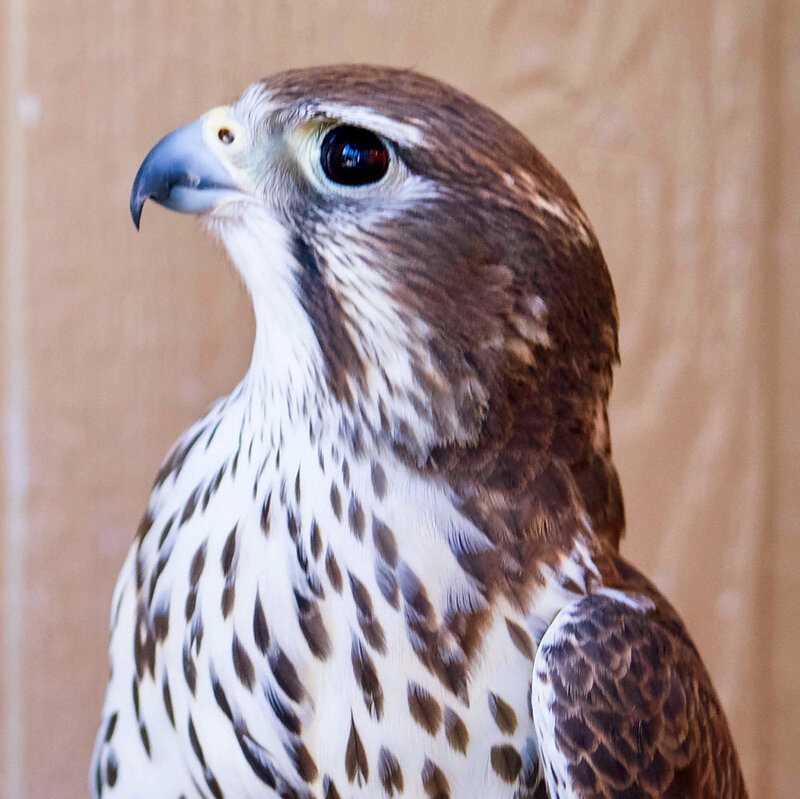 To identify prairie falcons, look for the pointed wings, white “eyebrows,” yellow around the beak, black “mustache” marks coming down from the corners of the beak, and yellow feet & legs. They also have dark-colored “armpit” areas that extend along the wing. Females are significantly larger than males, sometimes weighing over two pounds and having a wingspan of well over three feet. Prairie Falcons are protected under the Migratory Bird Treaty Act, though the greater Yellowstone ecosystem is year-round territory for them. Appropriately-licensed falconers in all three Yellowstone ecosystem states (Montana, Idaho, and Wyoming) are allowed to capture wild prairie falcons for falconry. In the wild, prairie falcons eat ground squirrels, horned larks, swallows, doves, small rodents, lizards, and amphibians. At the Sanctuary, we feed a variety of appropriate small animals. Unlike most of the hawks in this area which soar up high, prairie falcons tend to fly fast and low. In the wild, prairie falcons have a life expectancy of 15 years; in captivity they can live over 20 years. PAULI was born in 2011 and has been at the Sanctuary since 2012. She cannot be released into the wild because of a serious wing injury that eventually led to amputation. Her habitat is arranged with perches she can hop or walk on to and off of, since she can’t fly.